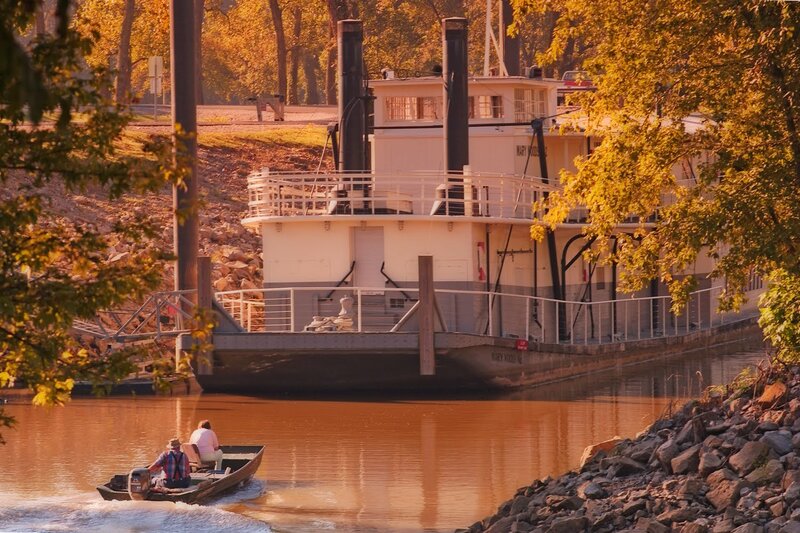 There’s something about a steamboat that instantly brings the Mississippi Delta to mind. A sense of purpose and determination, blended with the glory of high-class travel and riverboat shows, a sense of romance and history. 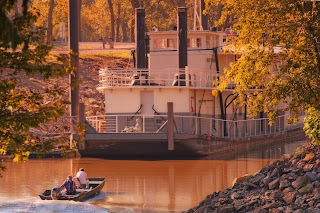 Arkansas State Parks has had a real treasure with the Mary Woods No 2, but whether or not she’ll be restored one more time and returned to service is still up in the air. 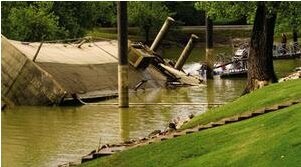 Early the morning of January 31st, 2010 she listed over on her side and sank at Jacksonport State Park. 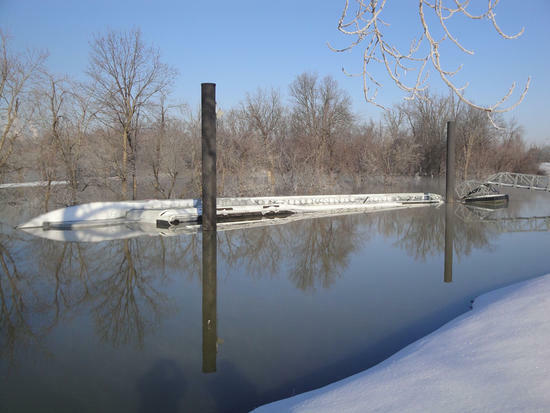 At first, her submerging was thought to be the act of two men whose footprints were found in the snow. Later it was determined that her sinking was accidental. The Mary Woods No. 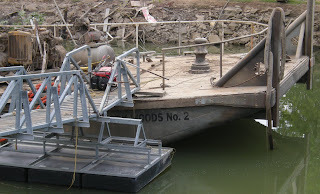 2 was built in 1931 by the Nashville Bridge Company in Nashville, Tennessee. Because of her flat hull, she drew just four feet of water (that is, only four feet of the boat were below the water’s surface) and could navigate the Cache, Black and White Rivers. She carried all sorts of sundries and supplies to little towns all over north Arkansas. She was converted from coal-steam to diesel-steam in 1937. She was donated to the Arkansas State Parks system in 1967 and has been at Jacksonport State Park ever since. She sank in 1984 in a cold snap because of a busted water line that, when thawed, allowed water into the boat. But she was quickly raised and restored. Back in 1997, I saw her at what I thought was her worse. I was a television producer for KAIT out of Jonesboro, AR at the time. On March 1st, a string of tornadoes roared up the Highway 67 corridor from south of Arkadelphia to near the Missouri border. I remember the day clearly; my then-fiancé and I watched a funnel cloud roll above our neighborhood in Jonesboro before taking off south, struggling through an awful cell in Weiner and passing through a just-struck tornado path south of Beebe on our way to Vilonia that day. 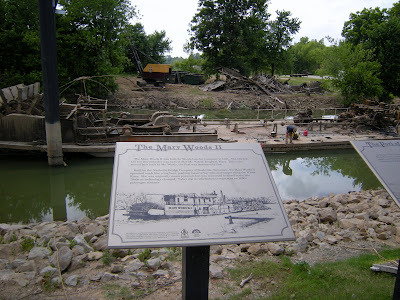 The next weekend we went out to Jacksonport State Park and viewed the damage to the steamboat. The top had been blown plumb off the pilot house, but it was still upright and tight on the water. 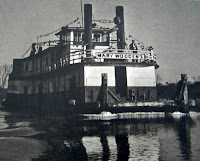 She was rebuilt and reopened in 2002, a grand steamboat restored to her glory. People could go aboard and tour her and see what life was like back in the 1940s aboard a working towboat. When I first heard the Mary Woods No 2 had sank this winter, I just assumed she’d be back up and shipshape in no time, because I remembered reporting about the 1984 sinking. I was really upset over the idea that vandals might sink her for fun. Months went past, and finally in May a company out of Missouri came down to bring her back to the surface. What they discovered was a sad state of affairs. 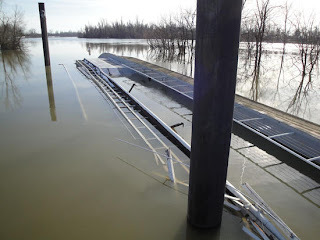 The water had inundated every part of the boat, and the superstructure above the deck had shifted. It was dangerous for divers to get in and impossible to implement the plan to fill the cabin space with air and right the boat in that fashion. I had to go. I needed to see for myself what was there, and to find out if she’d ever resurface. 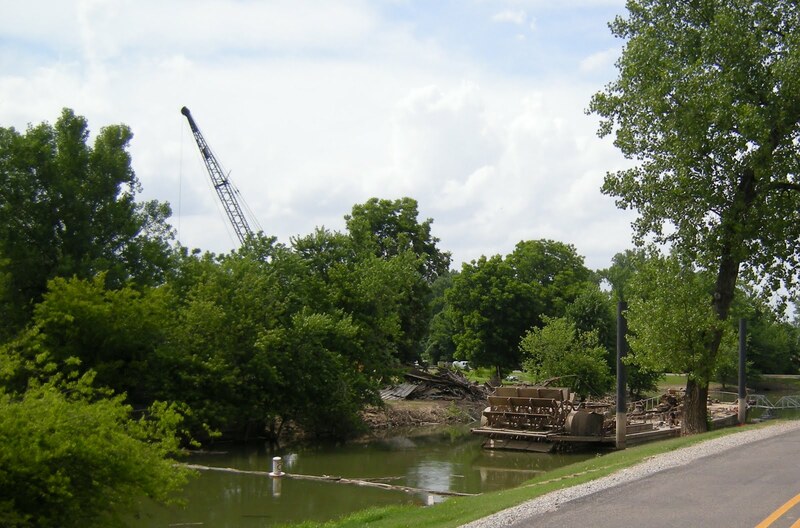 So on June 9th, a bright hot Wednesday, I drove to Jacksonport State Park for a view of what was left. I passed the courthouse and the turn-off road for the main area of the park, drove over the levy, and saw wreckage. A lot of wreckage, not what I had expected at all. The area had been cordoned off. I parked in the nearest lot and walked out to it. 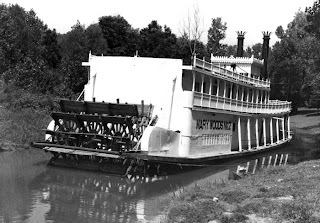 I was momentarily and suddenly relieved because I recognized her paddlewheel right off. What lay behind it from my vantage point took longer to sink in. 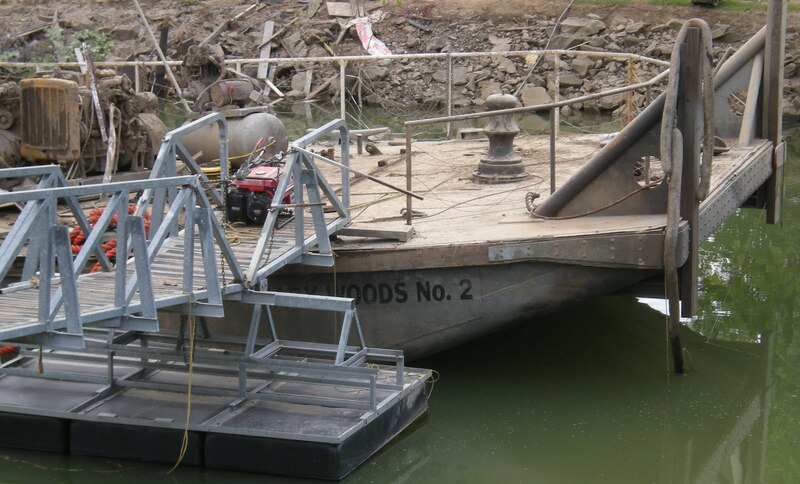 Beyond the warped paddlewheel lay not much more than a long mud-caked wooden deck and a few pipes and motors. The entire top of the boat was gone. I felt my stomach clench hard. This was far, far worse than the 1997 tornado. I was utterly shocked. I stood on the bank and watched for a while as a couple of guys worked on the mechanical bits while sitting on the boat. 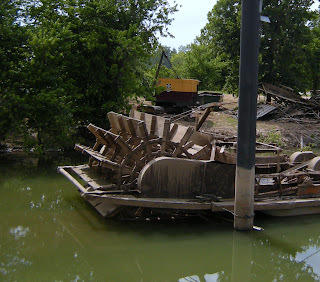 The crew from River Diving & Salvage, a joint out of Bloomsdale, Mo, have had their hands full. They tried turning her over and they tried filling her with air, but after three months on the river bottom there was just so much destruction. In the end, the crew had to haul out the wreckage of the cabin and drag it to the surface. The mess sits in a pile on the bank on the other side of the boat. I noticed a few old tin cans on the bank, never opened and without labels, rusting in the hot air. The gangway is still there, as are the exhibition markers that tell a truncated history of the boat’s past. To see what she used to look like and how she appears today is heartbreaking. A woman on the crew approached me and we talked a bit. She told me that the hull and deck and paddlewheel came to the surface the previous Friday. The Mary Woods No 2 had risen again on the first day of Portfest, the park’s annual festival. It seemed fitting. She also told me that whether and how the boat would be restored depended on whether or not the state decided it was worth the money. 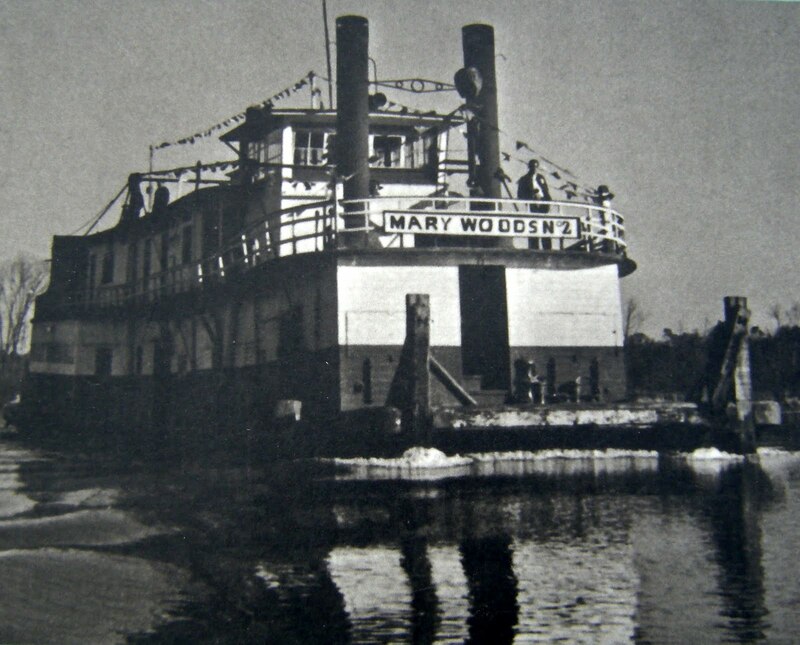 I recalled that the recovery from the tornado had taken five years, and between the courthouse and the steamboat the restoration had cost more than a million dollars. A gentleman from the Jackson County Sheriff’s Office came by to check me out, I guess. He didn’t ask me any questions, just walked up listening to our conversation. I suppose it was obvious I wasn’t there to cause any trouble. "I heard this was vandalism,” I mentioned. When I got back home, I contacted Mark Ballard with Jacksonport State Park and asked him about it. “There was a rust hole in a pipe above the waterline that allowed the boat to take on water, after the snow caused the boat to sit lower in the water,” he wrote. So yes, it’s awful, but it wasn’t intentional, and somehow that makes me feel better. There was insurance on the boat, I was told, but how much it’d actually cover is no one’s guess. We’ll just have to wait and see if she’ll once again float in her intended majesty alongside Jacksonport State Park. * Photos from this piece include selections from Arkansas State Parks, Encyclopedia of Arkansas, Steamboat.org, and the Newport Independent. Sadly, the Mary Woods No 2 will not be saved. 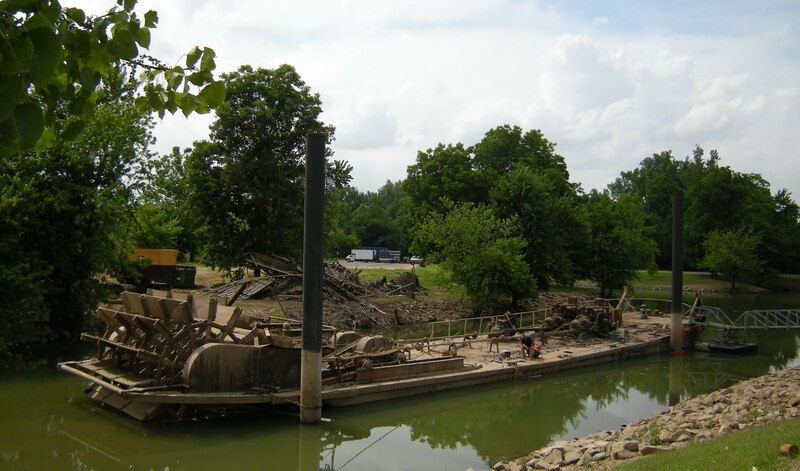 At its February 2011 meeting, the State Parks, Recreation and Travel Commission, the policy and advisory board over the state parks, voted to remove the boat from Jacksonport State Park. 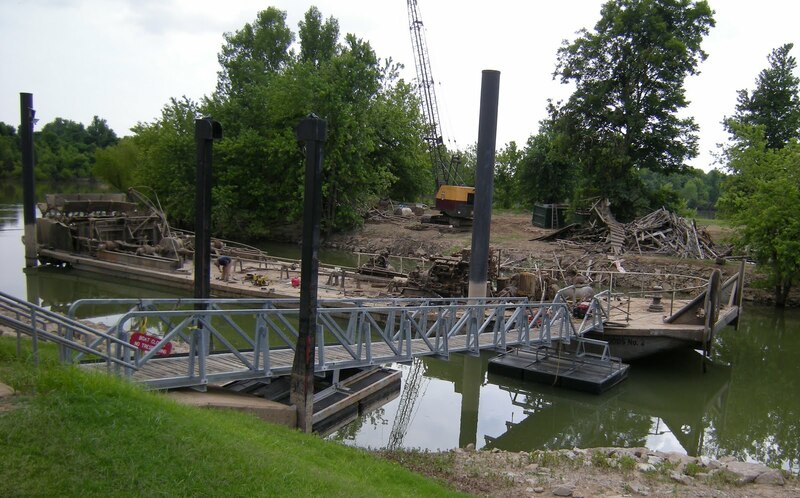 They're going to sell what's left of the boat and use the money for the park's planned visitors center. You can read more about it at www.arkansasmatters.com. I wonder what the park will do now. I wonder if there are other old tugs out there like the Mary Woods No 2, and whether there might be any efforts to bring another steamer to the park. Kat, if you find they start a fund or something, let me know and I'll put a link or something up at our site, Exploring Izard County. The Mary Woods 2 needs to be saved! Thanks for your photos. I haven't seen her since the mishap. I sure will... I haven't heard of any yet but I bet one might surface soon. So sad to see history lost and not reclaimed. Thanks Kat, for the coverage and follow up. I'm so sad to hear about this. My children and I visited Jacksonport State Park with my parents back in the early '80s. I remember the Mary Woods No. 2 very well. So glad I took pictures of her that day. That's the way I want to remember her.